Don't Panic! 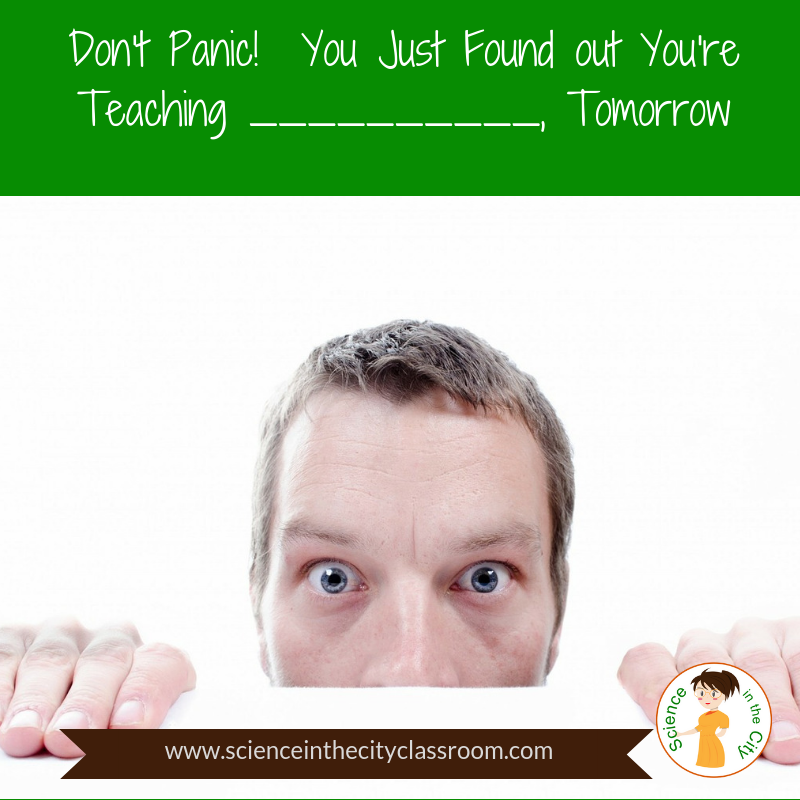 You Just Found out You're Teaching __________, Tomorrow! Sometimes your teaching assignment changes, whether it be for the year or for the day/week. That can be enough to throw you into a panic, and cause a lot of stress!! But you can handle it! There could be a lot of reasons that this happened. Some common ones I’ve seen are changes in course registrations or enrollments so that maybe extra section is offered, or one less section is offered and something else needs to fill in. Changes in staffing, even at the last minute someone quits, or their certification is not quite what it was thought to be. Things like assemblies, school-wide events, or other temporary schedule changes, or even weather delays, that can throw your plans out the window! Regroup, and don’t panic! You are a trained teacher, working with kids, and you know how to do this! Think about the big picture. What is the purpose for the change? What do you need to do right away? Do you need a filler activity for one day? Do you need to just start with some basic science skills while you let things settle out, and give yourself a chance to get planned further ahead? For many of these situations basic measuring and graphing, news articles about current science news, or a controversial science related topic can be a good place to start. You get a chance to assess students a bit, and they get to know you, and hopefully get some interest up about the upcoming class. A few activities that would be good for this situation would be this Buoyancy: Diving Ketchup activity, or this E-cigarettes Literacy Article and Position Paper. This is the time to lean on your colleagues, whether it is your real-life colleagues, those through professional organizations, Facebook groups, Twitter, Pinterest, or get on some mailing lists and make connections. Now, with all the technology at our disposal, it is easier than ever to make connections, share ideas, and find resources. This isn’t the time to design the perfect lesson plan, but to think about what you can do that will be a good start; or a rough draft. Consider it a ‘beta version.’ Be ready to make revisions, but get something to start with. If all you can do it set up a pacing guide, and plan some introductory activities, that’s ok for right now. You know what students have to do to start, then soon come back to your pacing guide and focus in on Unit 1. It will get easier as you get going, but don’t get too overwhelmed. You can do this. And if we can help at all, don’t hesitate to reach out in my Facebook Group and ask! Such a useful info! Thanks! My collegue advised view more for the same kind of content.